Here is an old pipe fitters rule concerning pipe: 6" and below is measured by the ID, as the schedule increases, so does the OD. 8" and above is measured by the OD, as the schedule increases the ID decreases. Kinda weird ain't it. I welded a ton of 4" SS heavy wall and it was 4" ID with an OD of 5.375". Who I thought that system was a good idea? Sounds like a ploy to keep pipe fitters employed since no one else could figure it out. Marv and other, thank you for all the details, it has given me hope of making a MT2 tailstock for my Taig lathe. Now that I know about pipe I no longer have to machine from solid! 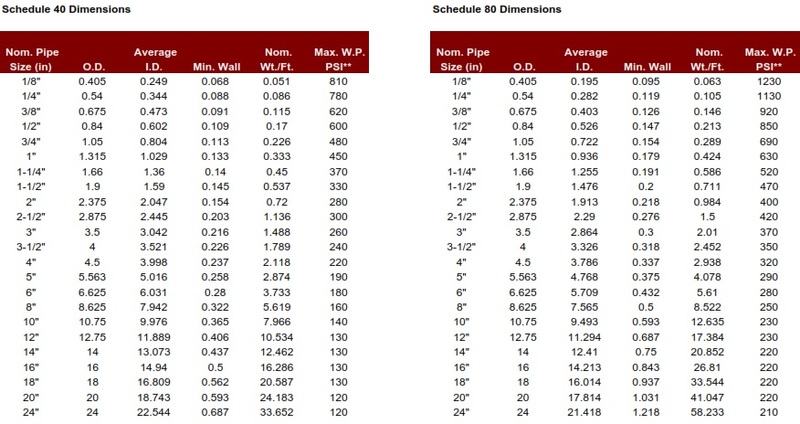 So it looks like, for Schedule 40, the ID matches the nominal size closely from about 2" to 12", and the wall thickness (t) for a pipe size (s) is very close to 0.1*sqrt(s). It's not as straightforward for schedule 80, although it is close to 0.17 * sqrt(s). It may be more linear with respect to actual ID, but that gets a bit more complicated. Stan, in this case as with most Stirlings, I don't think the wall thickness is a critical as keeping the weight of the displacer piston light. As you may recall, this was the one part I used the supplied tubing for and painted it with hi-temp black paint to minimize corrosion. If and when I do tear it down and replace the displacer piston, I would also consider aluminum for that. The waist of the hot cap is another matter. that section of the hot cap is usually made as thin as possible to minimize heat transfer as mentioned already. Using stainless only for the cylinder and hot cap tube would simplify this whole issue. Aluminum is an intriguing idea and a less expensive option for the displacer piston The issue woud be attaching the end caps. No TIG welding. With the thin wall, single point threading doesn't seem like a viable option. So, either JB weld or high temp Loctite? I have yes. But the ones found so far have a hardened tang and/or body, which means I can't machine that part. Looked at both taper sockets and extensions. I might order one of each when in Florida for the winter, and then anneal the area I need to machine. For the displace hot cap on my version of James G, Rizzo's Dyna (a horizontal BETTA motor), I got a 3" length of 2 1/2" 316 stainless steel, and carved it out of that, the hot end is about .015" thick, the bore 1 3/4". The open end has a internal thread that matches the other half of the cylinder. Since then I'v been trying to use thin wall stainless tube with an end TIG welded on. Thanks for that info, Ian. Just how hot do these engines run? Ian, I certainly can't dispute your experience, but IIRC Jerry Howell calls for aluminum in all of his Stirlings, at least those I have built. While it may be true that aluminum will come up to the internal temp of the hot end faster, any metal will eventually do that. The displacer piston's purpose is to push the hot air from the hot end up to the cooler end and then back to the hot end as it cools again. Keep in mind the hot cap transfers heat via conduction...hence stainless along with a minimum waist wall thickness limits that conduction. The convection that happens within the displacer chamber is less efficient. IN addition Stan's RE engine has a water jacket around the power piston to assist in keeping things cool. There is also a thermal insulator between the hot cap and the base casting which helps as well. Even after an extended run, the base casting of my RE never gets hotter than I can touch, and all of the castings are aluminum. Stan as for joining the end caps to aluminum tubing, JB weld for a good seal and some adhesive properties, but I would also put in a small screw every 90 degrees in both the top and bottom caps for a mechanical connection. Small flat heads ( say 1-72 or 2-56) shouldn't interfere with the small clearances between the displacer piston and the side walls. Just my 2 cents. I had read much Stirling info before beginning this build. You are correct re: Jerry Howell's use of aluminum displacer pistons. 1.875 OD with .06 wall. A cleanup pass on the lathe should get me near a 1.85 OD with about a .058 wall. Close enough. I like the JB Weld + a mechanical connection. That seems to solve the displacer piston question. The cylinder and hot cap will be 304 SS tubing. To be ordered today along with some SS flathead screws. Look for a build log post this evening. bill, an example of aluminium displacer: on mk 1 of my free piston GAMMA motor, mild steel hot cap, aluminium aerosol can displacer, I had 3 melt downs(a bit of a slow learner) until I changed to stainless steel. Most of my motors have the hot end (about 1/3) blue. I will admit that I try to push the temperature as high as I can. This is a hot cap, made from a bit of 316 bar, the bore made first, including the thread on the open end, then it was placed on a mandrel, and the out side taken down to about .020", this runs well at red heat. I have done the same as Ian, turning hot cap and displacer from sold stainless rod (303 not 316!). I don't weld anything though, I bore them first to depth and flatten the bottom of the bore, then cut them off leaving a blind end. thickness of the walls and end. Wall thicknesses of .02 and less are surprisingly easy to achieve. The parts are amazingly light and pretty to look at. I hope to show all this soon in a retrospective build log for the machine I'm working on. I found this on the stirling engine forum. The concept of an aluminum displacer acting as a regenerator.